Just finished this Salamander Commander conversion for a Client of mine that I've done a few other conversions for as well (Old School Librarian, Vulkan conversion). I have to say, this model has been one of the most fun I've had in a while when it comes to building Space Marine characters. 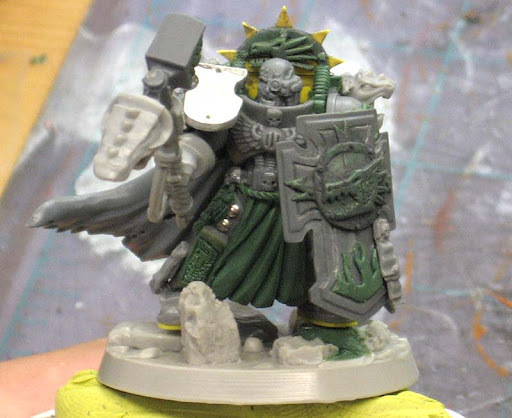 He was a bit of a challenge when it came to getting the right "look" and the fact that I didn't want to recycle any of the bits I used in previous conversions for the same army. The inspiration comes from this picture. I absolutely love the custom Iron Halo and the cables that run to it. I knew one day I'd have the chance to incorporate this into a model for someone. Here you can see the beginning of the Halo made of plasticard and greenstuff. The cables were added near the end after I put a wire framework in place to support them. His backpack is a combination of the Chaos dragon vents and the cape from the Plastic Chaos Terminator Lord (with some modification). 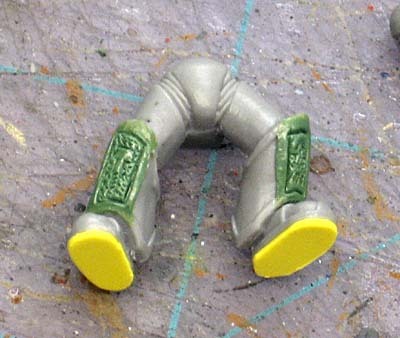 I added some ornate relief work to his greaves along with studding out his right thigh. Combined with the half tabard and additional waistline elements, it really helped bulk him out. I also added spacers (again with plasticard) to the bottom of his feet to give him a slight lift in height. 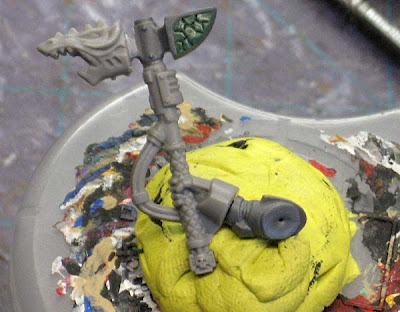 Looking to really keep the Salamander theme throughout the model, I converted his thunder hammer and storm shield to include Salamander iconography. Building a model like this really forces you to look at each element on the model and scrutinize them. It takes lots of small details to pull off the overall look in the end. 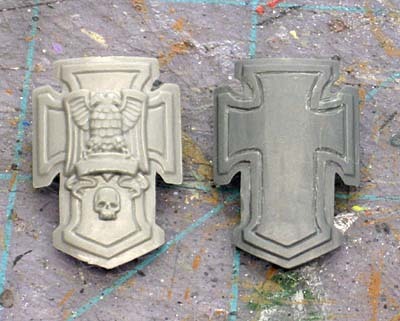 They can be tons of work to do, but as a character model, they can have a huge impact on the overall look and feel of an army. I'm never disappointed in your work, but this guys is my favorite that you've done so far. Very nice. Fantastic! I wish I had a quarter of your greenstuff skill. The details you've added are ridiculously good. Where did the back peice/cloak come from Ron? Very good indeed. The use of green stuff is subtle yet it defines the model. 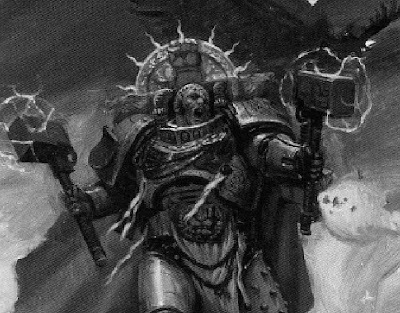 The thunderhammer is a bit overkill in my opinion but I guess a Space Marine commander should have over the top weapons after all. I agree with the innergeek, this is the best one you have so far. 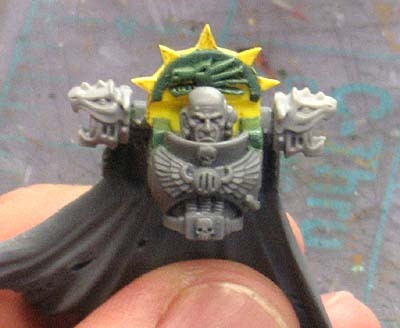 Spacemarines suit your modeling style I think. The left shoulderpad with the wreath is amazing, tutorial??? Capitola Family: Sure, let me get a couple of them together and I will show you how I do some of the more "regular" ones. Which kits exactly did you get the dragon heads for the backpack and hammer from? 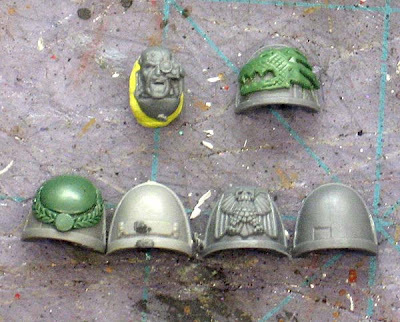 Anon: Thanks, the dragon heads for the backpack are from the Chaos vehicle sprue I believe. They are the small vehicle weapon muzzles.